Scott is a partner in Aitken Klee’s Toronto Office with deep experience in the pharmaceutical and biopharmaceutical sectors. Prior to joining Aitken Klee, he was the first biopharmaceutical patent attorney at an international generic drug manufacturer where he was responsible for global intellectual property matters for a portfolio of small-molecule drugs and all of the companies biopharmaceutical projects. 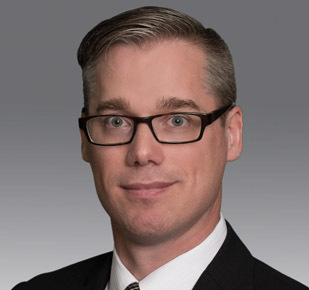 Scott has also served as chair, of the Intellectual Property Committee for the Canadian trade association representing generic drug manufacturers. Scott has a proven track record in litigation under the Patented Medicines (Notice of Compliance) Regulations representing pharmaceutical clients in the Federal Court, the Federal Court of Appeal and the Supreme Court of Canada. Scott has represented both generic and branded pharmaceutical companies. He successfully represented a client in a seminal case that that clarified the proper approach for assessing obviousness. He also successfully represented a client in a matter that redefined which types of claims need to be addressed under the PM(NOC) Regulations. More recently, Scott was counsel for one of the interveners in the Supreme Court of Canada in a decision that redefined the proper approach to assessing utility under Canadian patent law. Scott regularly speaks at national conferences on patent issues related to pharmaceutical and biosimilar patent law and a regular contributor to Aitken Klee’s blog covering recent developments in intellectual property law. Scott is a registered Canadian patent and trademark agent. Scott’s was awarded the G. Richard Riser Award for outstanding graduate research for his work investigating the consequence of amino acid substitutions on protein dynamics, energetics and folding using high field 15N and 13C NMR. Identification of a residue critical for maintaining the functional conformation of BPTI. Hanson WM, Beeser SA, Oas TG, Goldenberg DP J Mol Biol. 2003 Oct 17;333(2):425-41. Enhanced protein flexibility caused by a destabilizing amino acid replacement in BPTI. Beeser SA, Goldenberg DP, Oas TG. J Mol Biol. 1997 May 30;269(1):154-64. Mutations of iso-1-cytochrome c at positions 13 and 90. Separate effects on physical and functional properties. Huang Y, Beeser S, Guillemette JG, Storms RK, Kornblatt JA. Eur J Biochem. 1994 Jul 1;223(1):155-60.